The captured cats are brought to a partner vet. STERILA's TNR programm also includes deworming, etc. Become an expert – plan and organize your cat mission well! Hands off: never have a cat sterilized that is very tame, or shows an ear tattoo, a clipped ear (EC cat) or is younger than 6 months; REMEMBER: Attached cats might have been sterilized already (with no visible proof)! Also, from March till November many cats are pregnant. Therefore, in case of doubts, trap/neuter/return a clearly unsterilized MALE cat! Organizing a successful TNR mission makes absolute sense but is NEVER easy (timing/waiting time for captured cat, vet appointments/working hrs., transportation, emotions, etc.). 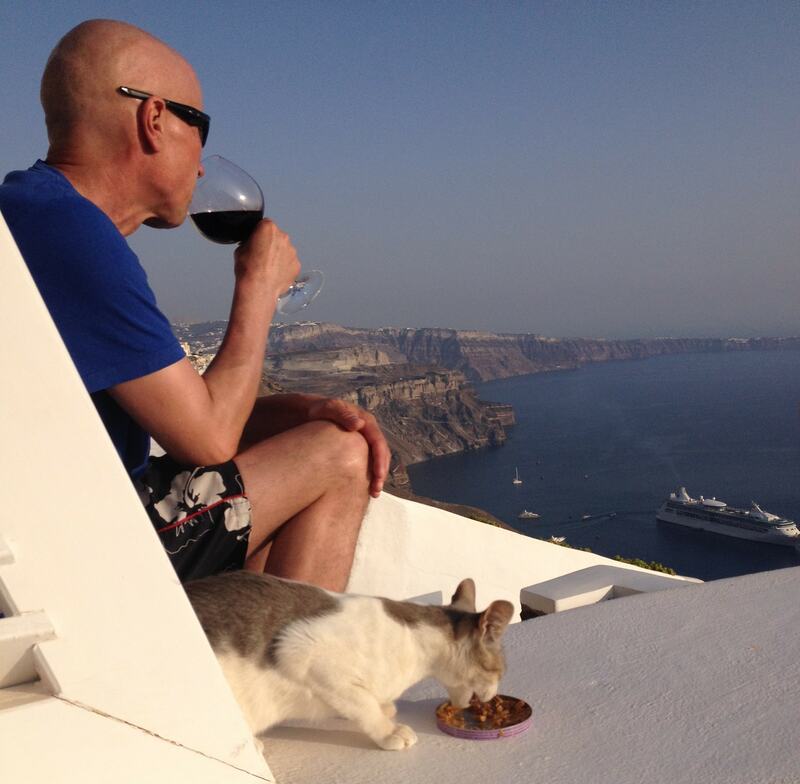 There is NO cat shelter on Santorini. Some cats (too young, too ill, injured, etc.) are not up for sterilization; some cats (FIV+/cat “aids”) are not up for return (to exactly the place where caught, no exceptions). Please think twice before getting involved. It can be devastating to realize your error when in the middle of a rescue action causing immense stress to the stray you have captured. Instead, talk to us: Most wonderful saved kittens, cat brothers and sisters ready to travel, are waiting to be adopted by a cat loving person who will supply a perfect home for ever. Please consider joining a STERILA-action week (November till March = least pregnancies) for a few days or so: We truly need every volunteer driver, caretaker, cat lover we can get! Please contact us – we appreciate to be in touch. You may want to opt for peaceful holidays instead of chasing male cats. And you may not want to return to Santorini during the winter months either. But in any case, you do want to help reduce the suffering of cats? Easy: Support STERILA with your cat food donation instead (drop off at STERILA HQ in Kamari, Santorini) and help us stock up for our local feeding point network. Or simply join STERILA and become a mission mate member (EUR/CHF/$ 100/year). Also, please do share your pictures of ear-clipped (EC) cats with us and the world. Yes, you CAN help STERILA achieve its biggest goal: Donate money for a cat shelter solution! We’re aiming at providing cat homes before the winter 2018/19 torments the strays again, out on the empty streets of Santorini! We need a place for cats during sterilization (temporary stay), for the many kittens found in the garbage, and for cats too young for sterilization. We need a shelter for moms with small kittens and for ill/reha/injured cats. Thank you for helping us reaching our biggest goal: A cat shelter on Santorini. Lastly, you can help the cats of Santorini a lot by supporting, following and sharing (Facebook etc.) our growing network uniting local and foreign cat lovers, animal welfare activists, partner vets and partner organizations such as SAWA, Hundehilfe Santorin, and many others. We thank you with a bittersweet meow for your financial donation, wired or cash (for cash donations: please visit STERILA HQ in Kamari/Santorini). A CAT SHELTER on SANTORINI for feline relatives that can’t make it out on the streets of Santorini! FYI: our volunteers cover their expenses (gas, accommodation, etc.) themselves, always. On this occasion: CHEEEERS to all mission mates out there – you are amazing! ...Feel good if a cat adopts you. Feel your heart jump with joy when detecting an EC cat! This fellow friend has a better life thanks to your support! You can see the proof of our work, the EC sign will show it to you! You make it all possible! You actively reduce the suffering of cats on Santorini. STERLIA is documenting every sterilization, including pictures of each cat before and after OPs. We therefore can track the cats’ history. We truly love receiving pictures of STERILA-cats! Please also tell us when and where you have detected an EC cat. This means so much to us! It is the wonderful reward of hard, expensive, sad and tough TNR-work! It makes us keep on going, stronger! Lucia + Villy + your STERILA volunteers.